I can't believe Easter is a week away. This year is flying by. We register for kindergarten tomorrow and I can't even believe that!! Honestly, I'm not really emotional about it (yet). It's an exciting milestone and I know that the princess is totally excited and ready to start school. Being an only child, she is completely ready for some interaction with other kids. I just hope she can keep the drama toned down and listen to her teacher. The princess is somewhat of a late bloomer. She really didn't get excited about Halloween and Christmas until this past year. She's getting excited about Easter now too. We talk about the Easter Bunny and how he comes to your house and brings you an Easter basket filled with goodies. Since she kinda sees the Easter Bunny being like Santa, she asked if we needed to leave him anything for his visit. I suggested we make Bunny Bait. It was the perfect snack for her to assist on, as I am generally an OCD control freak in the kitchen and do not share my time well (mother of the century, I know). She said she liked it, except it could use more M&Ms. LOL! Melt the almond bark in a double boiler or in the microwave in a microwave safe bowl. Personally, I find it easier to use the double boiler. Once all the almond bark is melted, pour over the cereal mixture. Stir gently making sure all the mixture is coated with the almond bark. Next, pour the mixture out onto a cookie sheet. You may need to use two, depending on the size of your cookie sheet. Spread out the mixture evenly and then pour sprinkles generously over the top. Allow to cool and then gently break into pieces and store in an airtight container. This is a great recipe for the kids to do! My 5 year old is quite excited for the Easter bunny too! But she’s sort of addicted to candy. This is a fun recipe, we have to do this today! 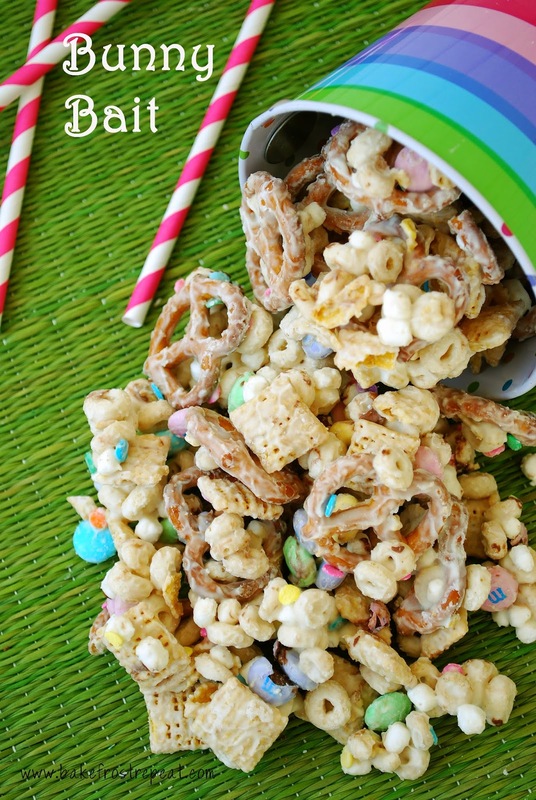 This is such a great snack - love how fun and festive it looks! Aaw, good luck with the kindergarten registration - can't believe how quickly they grow up.